whether those goals are met." Basically, when you're looking at the various programs of the many Ontario universities, you end of feeling like you're looking at more-or-less the same blueprint, cheating the student of real choice and the university of opportunities to focus on, and develop, their strengths..."Ontario universities should play to their strengths instead of trying to be everything to everyone" (Globe and Mail article). Bullying is a major issue for educators, espcially cyber-bullying, and a recent national survey (US) on bullying, The Ethics of American Youth: 2010 found that half of high school students say they've bullied someone in the past year, and nearly half say they've been the victim of bullying. The study was prepared by the Josephson Institute of Ethics, surveyed an astonishing 43,000 high school students, and asked them whether they'd been physically / emotionally abused in a way which really upset them. And if you're looking for examples of policies to use in your school to deal with cyberbullying and ECD (Electronic Communication Devices) usage within school boundaries / time, take a look at what the University of San Diego is working on, they've developed short and long version of student discipline rules. Minorities in Higher Education 2010. This 2010 edition analyzes the latest racial/ethnic and gender trends in high school completion, college enrollment, persistence, degree completion, faculty, administrators, and presidents. A key finding is that while postsecondary educational attainment continues to flat-line in the United States, attainment rates have dipped for the youngest group (aged 25 to 34). 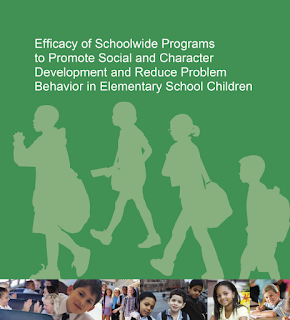 Efficacy of Schoolwide Programs to Promote Social and Character Development and Reduce Problem Behavior in Elementary School Children is the largest US government (Institute of Education Sciences) study to date of character-building or social-development programs (656 pages long...), and it concludes that these programs, well, don't really produce any improvements in student behaviour or academic performance. A lot of pros and cons to this study, especially given the nature of the study; for anyone considering such a program may be worthwhile taking a look at this report. Repeated testing produces superior transfer of learning relative to repeated studying, this Journal of Experimental Psychology: Learning, Memory, and Cognition article suggests students might learn more / better if taught with a test instead of to it. Not sure about the value of this. Yes, students may learn better that way but it's essential they learn to "be tested", to think on their feet for real-life fail or pass scenarios (think job interviews).